Hello everyone!! 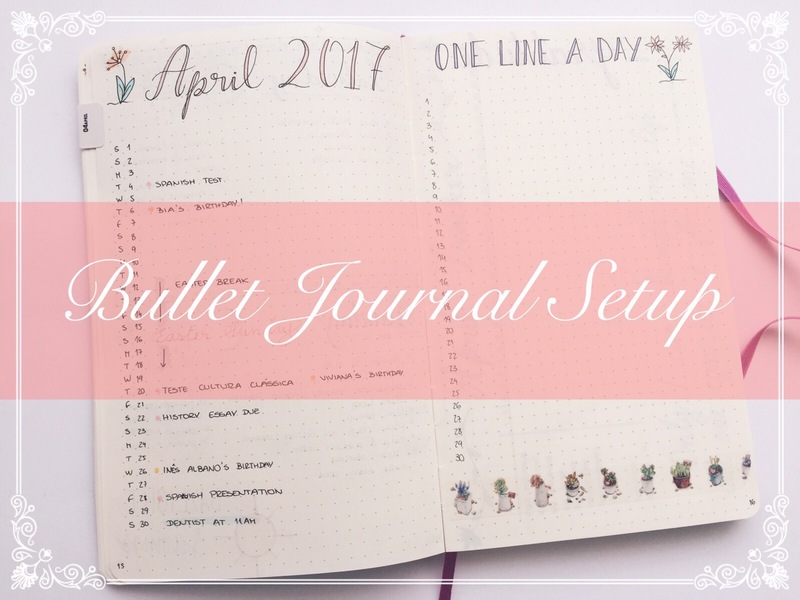 Today’s post is very exciting for me, because I got a new dotted journal and had a great afternoon yesterday setting up for April. If you’re interested in watching me set it up, the video is linked below! I got a softcover Moleskine in the pink/purple color, and I really like it! It’s much lighter than my Leuchtturm, because it’s a softcover and also has less pages, which is just what I needed to carry around with me. 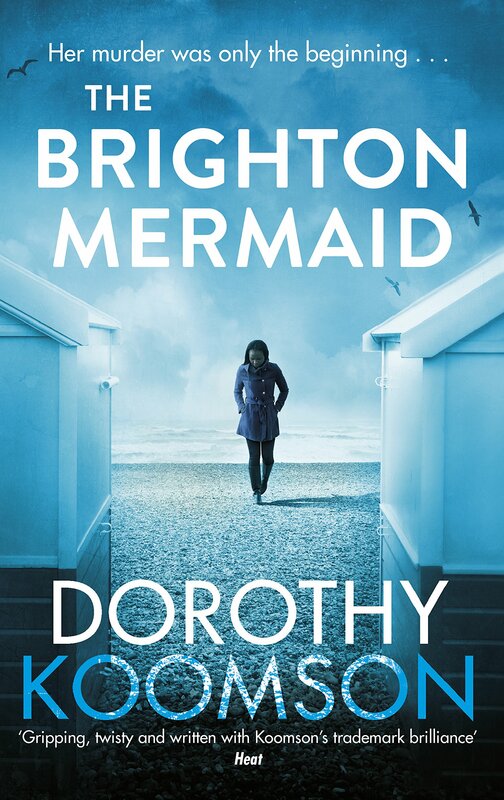 If you’re interested, all three colors are on sale on BookDepository: Pink, Blue and Beige. To decorate it, I just stuck a pretty postcard from the Archaeology museum in Lisbon to the cover with some washi tape. If you remember, I also did this with my last journal, it looks very pretty and takes very little time to do!! First up, as always, is my monthly spread. I like the list format more than the traditional table, because this way I have more space to write on each day. 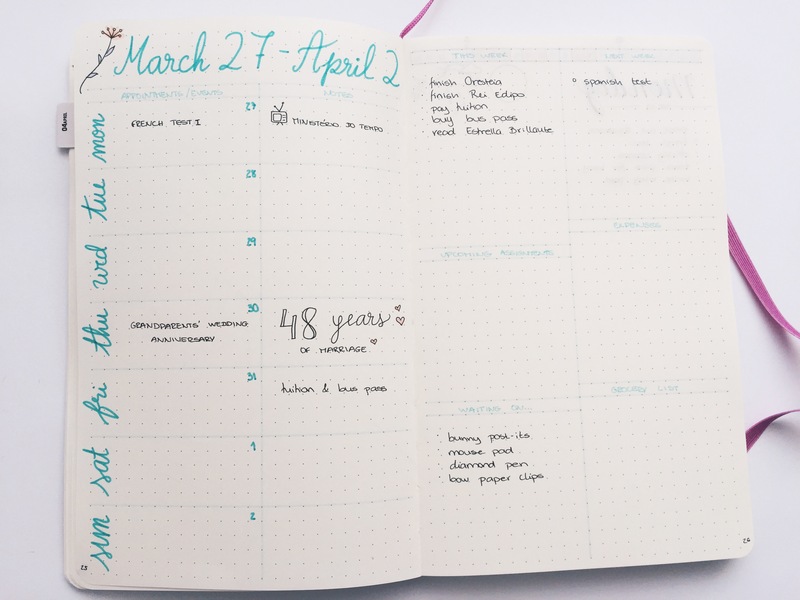 In my monthly page, I mostly write any events, appointments and birthdays that are coming up. I also include holidays and school breaks, as you can see from the 12th-18th of April. 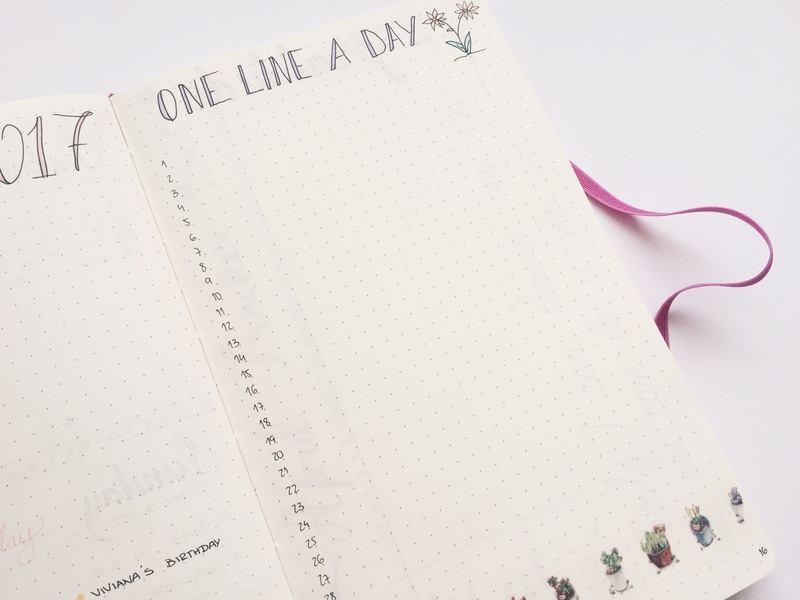 On the next page is my One Line a Day log. In this page, I will write a little sentence each day, relating to something that happened on said day. 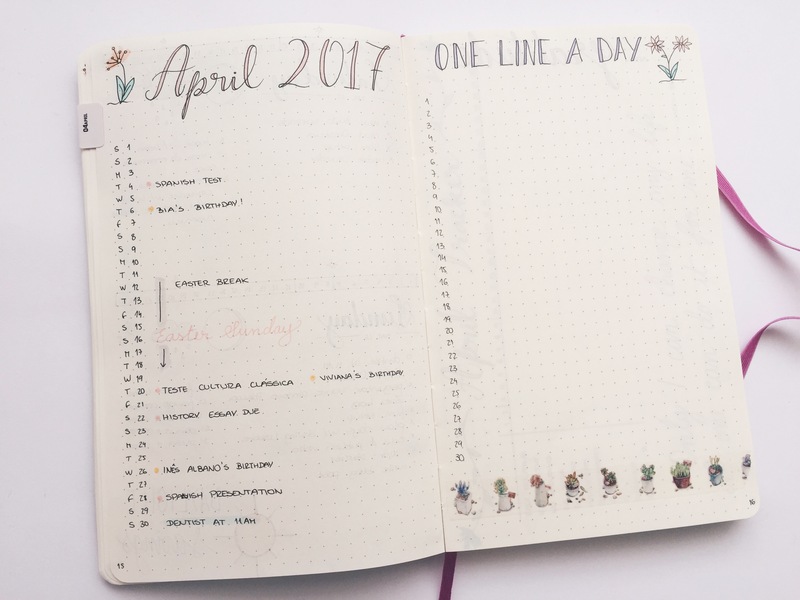 I got the idea from Kara, and I did this spread last month but, sadly, didn’t stick to it. 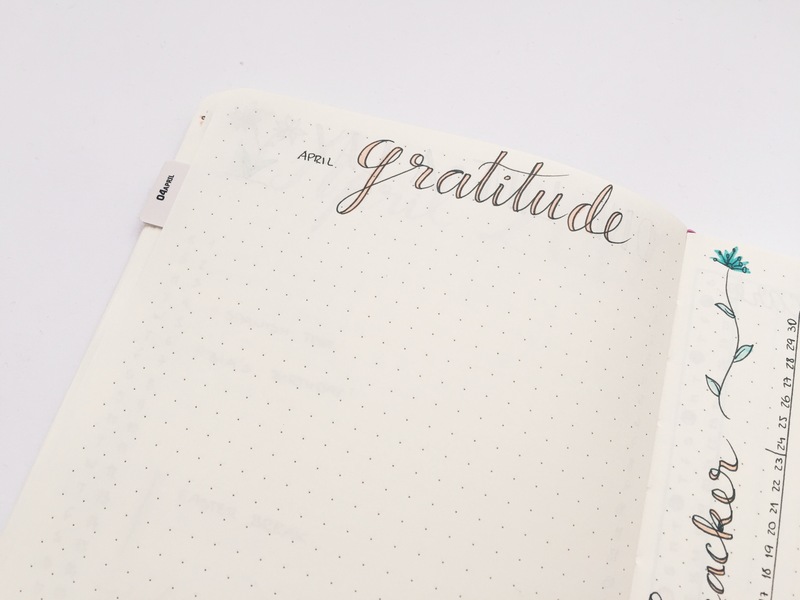 Next up is my Gratitude log, in which I will write/draw things, people, anything I am grateful for. This helps me when I’m sad, because if I flip back to this page, I will see a whole page filled with things that I should be grateful for, and it will most likely cheer me up! The next page is my habit tracker. I’ve been tracking habits for a few months now and, believe it or not, when I sit down to fill in the squares and I didn’t do something that day, it makes me get up and do it, just so I can make the tracker look pretty and colorful. Silly, I know, but hey, it works! 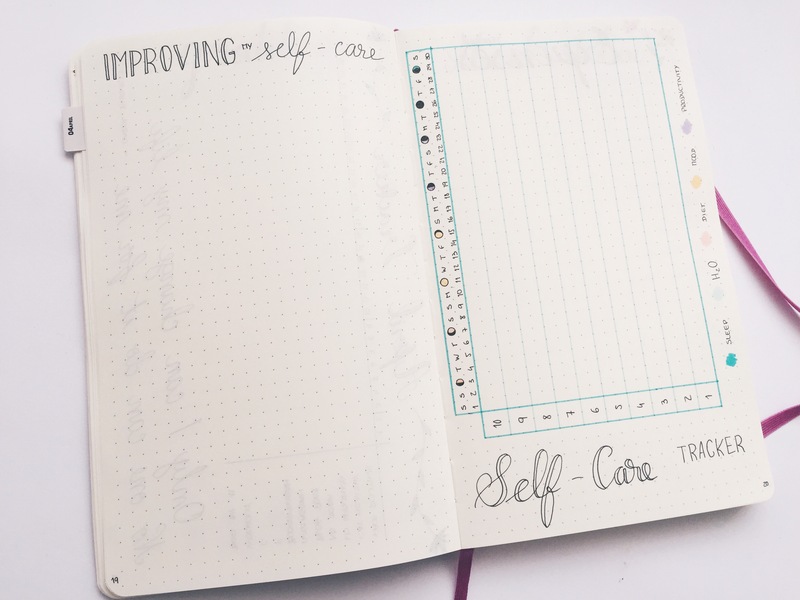 Next up is my self-care tracker. 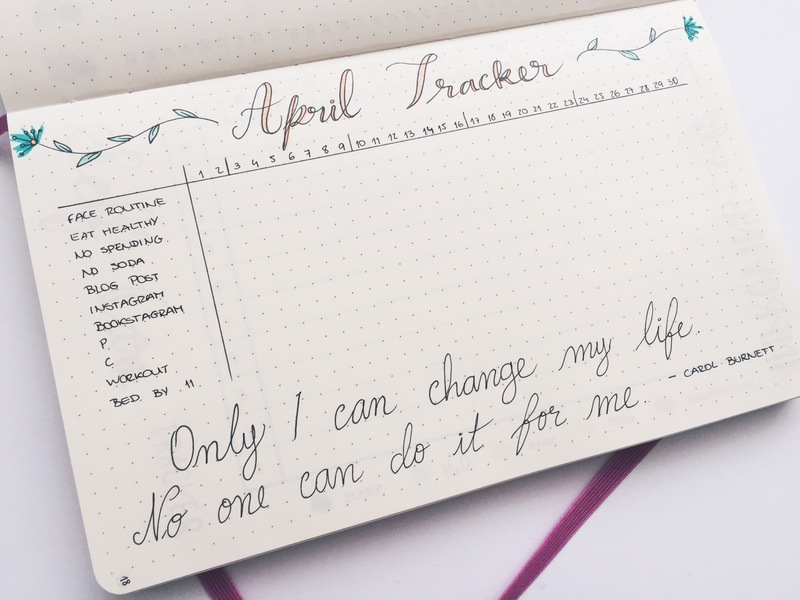 I used to incorporate this in my weekly spreads, and I tried including it in my habit tracker page, but it was too much to keep in one page, so I made this spread which is inspired by Kara. Next is my Expenses tracker. I always include one of these each month, because I like to see where my money is going, and maybe make adjustments based on what I see at the end of the month. Next to the expenses page is my Meal Planning. I use this page to plan the meals that I have to cook to take with me to college. 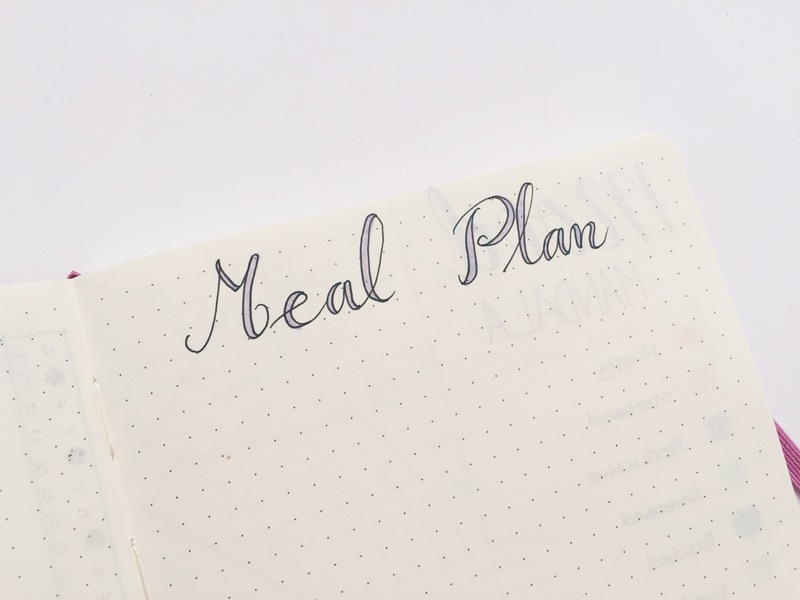 After I decide what I want to cook, I will see what I need for each dish, and I will write down the groceries I need in my weekly spread, as you’ll see below! The last “monthly” sort of spread is my Mood Mandala. This was originally created (I believe) by @bujo.mama on Instagram. Beautiful, right? I can’t wait to start filling it in!! 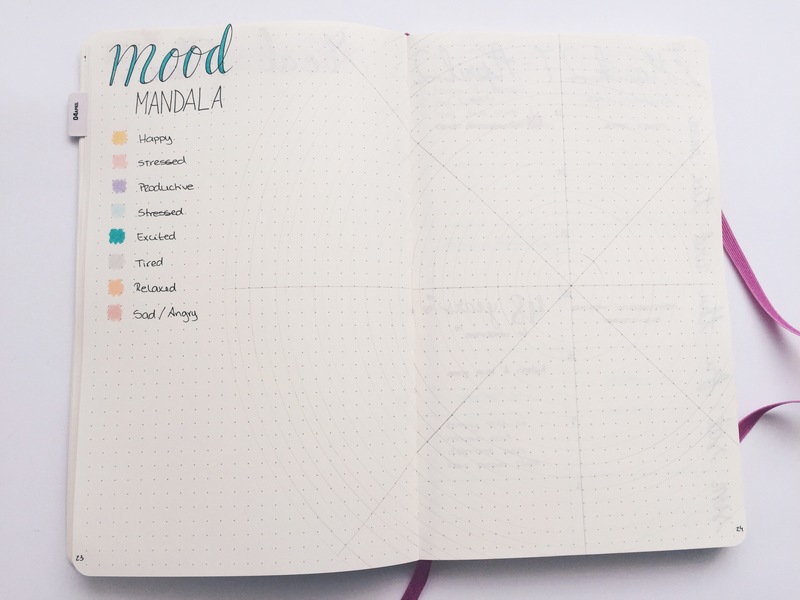 After the Mood Mandala, I set up for this week. 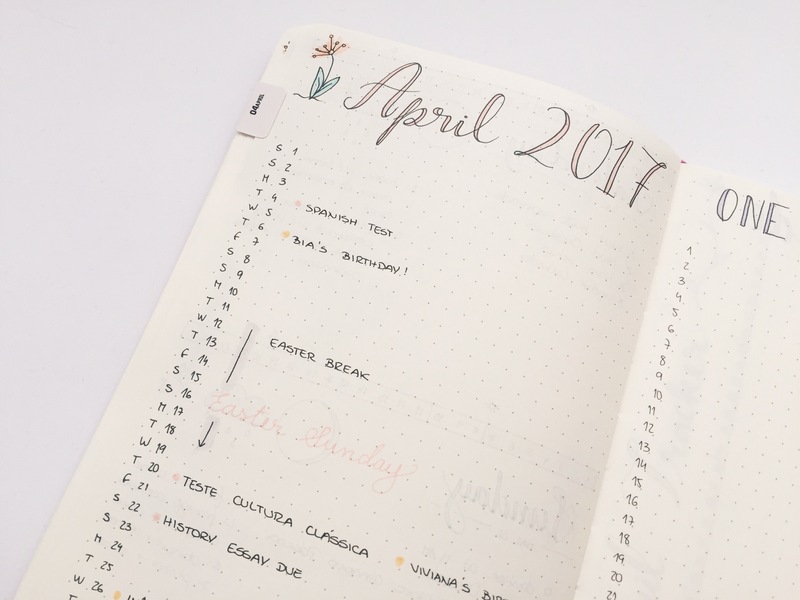 Weekly spreads are very efficient for me, because seeing my weeks at a glance helps me organize and see when I should do certain tasks. 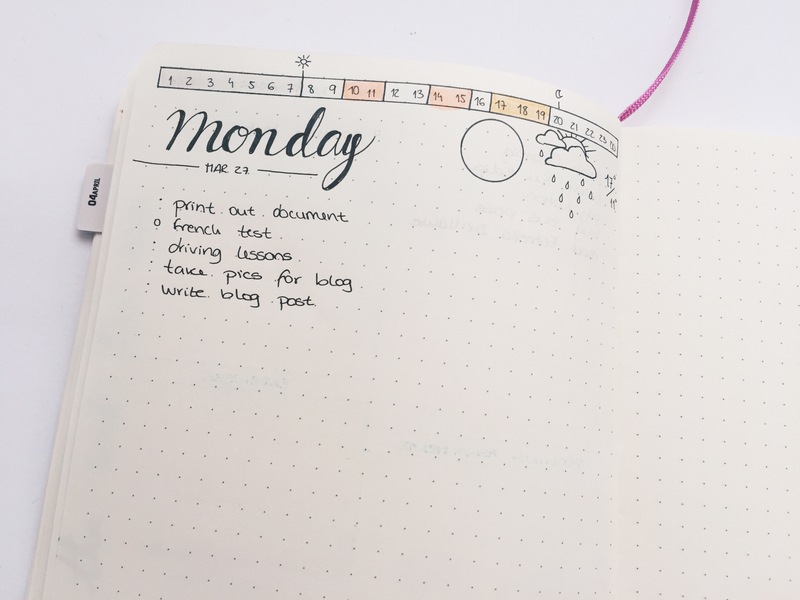 I use Kara‘s weekly spread, and it works very well. 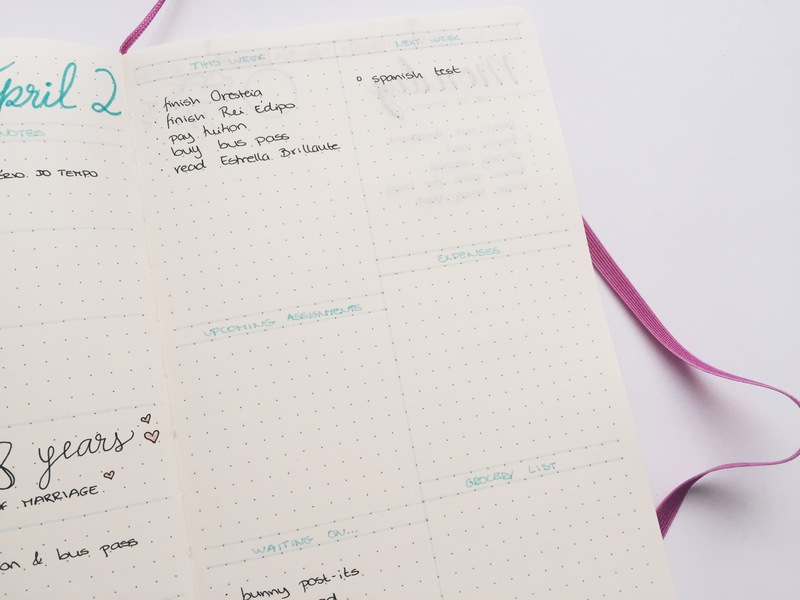 This week I included this week’s and next week’s tasks, because that’s the most important. 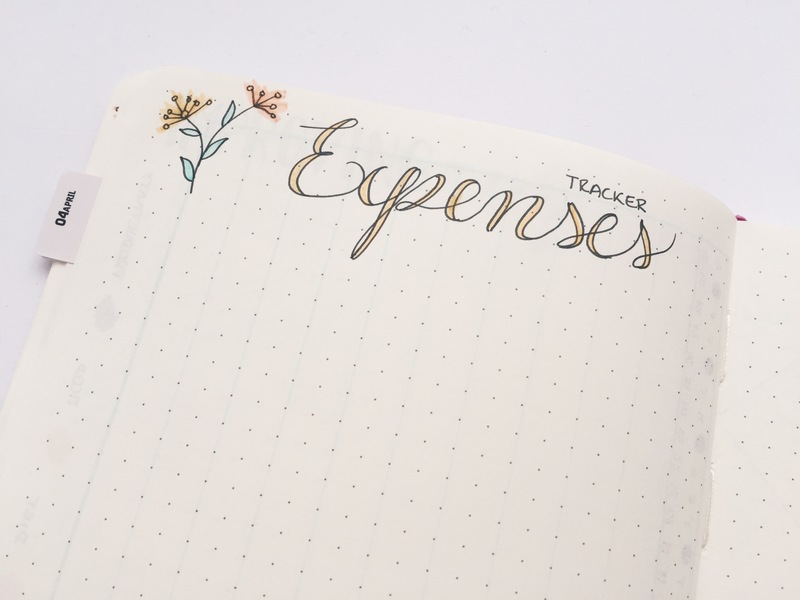 I also added some space for upcoming assignments, for expenses (I should have written “to buy” instead of expenses, because I already have a spread for expenses), and for any groceries that I need to buy. I also like to include a little box where I track if I received the orders I’m waiting on. And the last thing in my bullet journal is today’s entry. In my dailies I like to track the weather, the moon and my time, as well as my meals (I write them below the weather and moon). Alright guys, that’s all for my setup! If you have any questions or suggestions you can leave them in the comments below, I would love to see/answer them!